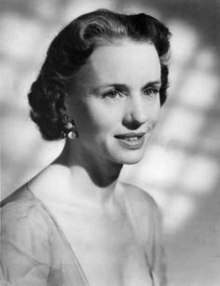 Jessica Tandy (born Jessie Alice Tandy; 7 June 1909 – 11 September 1994) was an English-American stage and film actress best known for her Academy Award winning performance in the film Driving Miss Daisy. Tandy appeared in over 100 stage productions and had more than 60 roles in film and TV. Born in London to Jessie Helen Horspool and commercial traveller Harry Tandy, she was only 18 when she made her professional debut on the London stage in 1927. During the 1930s, she appeared in a large number of plays in London's West End, playing roles such as Ophelia (opposite John Gielgud's legendary Hamlet) and Katherine (opposite Laurence Olivier's Henry V). During this period, she also worked in a number of British films. Following the end of her marriage to the British actor Jack Hawkins, she moved to New York in 1940, where she met Canadian actor Hume Cronyn. He became her second husband and frequent partner on stage and screen. She received the Tony Award for best performance by a Leading Actress in A Play for her performance as Blanche DuBois in the original Broadway production of A Streetcar Named Desire in 1948. Tandy shared the prize with Katharine Cornell (who won for the female lead in Antony and Cleopatra) and Judith Anderson (for the latter's portrayal of Medea) in a three-way tie for the award. Over the following three decades, her career continued sporadically and included a supporting role in Alfred Hitchcock's horror film, The Birds (1963), and a Tony Award-winning performance in The Gin Game (1977, playing in the two-hander play opposite Hume Cronyn). Along with Cronyn, she was a member of the original acting company of the Guthrie Theater. In the mid-1980s she had a career revival. She appeared with Cronyn in the Broadway production of Foxfire in 1983 and its television adaptation four years later, winning both a Tony Award and an Emmy Award for her portrayal of Annie Nations. During these years, she appeared in films such as Cocoon (1985), also with Cronyn. She became the oldest actress to receive the Academy Award for Best Actress for her role in Driving Miss Daisy (1989), for which she also won a BAFTA and a Golden Globe, and was nominated for an Academy Award for Best Supporting Actress for Fried Green Tomatoes (1991). At the height of her success, she was named as one of People's "50 Most Beautiful People". She was diagnosed with ovarian cancer in 1990, and continued working until shortly before her death. The youngest of three siblings, Tandy was born in Geldeston Road in Hackney, London. Her father, Harry Tandy, was a travelling salesman for a rope manufacturer. Her mother, Jessie Helen Horspool, was from a large fenland family in Wisbech, Cambs, and the head of a school for mentally handicapped children. Her father died when Tandy was 12, and her mother subsequently taught evening courses to earn an income. Her brother Edward was later a prisoner of war of the Japanese in the Far East. Tandy was educated at Dame Alice Owen's School in Islington. 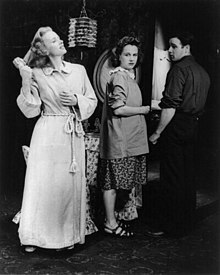 In 1947, Jessica Tandy (left, with Kim Hunter and Marlon Brando) created the role of Blanche DuBois in the original Broadway production of A Streetcar Named Desire, and received the Tony Award for Best Performance by a Leading Actress in a Play. Tandy began her career at the age of 18 in London, establishing herself with performances opposite such actors as Laurence Olivier and John Gielgud. She entered films in Britain, but after her marriage to Jack Hawkins failed, she moved to the United States hoping to find better roles. During her time as a leading actress on the stage in London she often had to fight for roles over her two rivals, Peggy Ashcroft and Celia Johnson. In 1942, she married Hume Cronyn and over the following years played supporting roles in several Hollywood films. Tandy became a naturalized citizen of the United States in 1952. Like so many stage actors, Tandy had a hand in radio, as well. Among other programs, she was a regular on Mandrake the Magician (as Princess Nada), and then with husband Hume Cronyn in The Marriage which ran on radio from 1953–54, and then segued onto television. She made her American film debut in The Seventh Cross (1944). The Hollywood studio system did not know what to do with Tandy. Failing to gain leading roles, she was relegated to supporting appearances in The Valley of Decision (1945), The Green Years (1946, as Cronyn's daughter), Dragonwyck (1946) starring Gene Tierney and Vincent Price and Forever Amber (1947). Over the next three decades, her film career continued sporadically while she found better roles on the stage. Her roles during this time included The Desert Fox: The Story of Rommel (1951) opposite James Mason, The Light in the Forest (1958), and a role as a domineering mother in Alfred Hitchcock's film, The Birds (1963). On Broadway, she won a Tony Award for her performance as Blanche Dubois in the original Broadway production of A Streetcar Named Desire in 1948. After this (she lost the film role to actress Vivien Leigh), she concentrated on the stage. In 1977, she earned her second Tony Award, for her performance (with Cronyn) in The Gin Game and her third Tony in 1982 for her performance, again with Cronyn, in Foxfire. The beginning of the 1980s saw a resurgence in her film career, with character roles in The World According to Garp, Best Friends, Still of the Night (all 1982) and The Bostonians (1984). She and Cronyn were now working together more regularly on stage and television, including the films Cocoon (1985), *batteries not included (1987) and Cocoon: The Return (1988) and the Emmy Award winning television film Foxfire (1987, recreating her Tony winning Broadway role). However, it was her colourful performance in Driving Miss Daisy (1989), as an aging, stubborn Southern-Jewish matron, that earned her an Oscar. She received a Best Supporting Actress nomination for her work in the grassroots hit Fried Green Tomatoes (1991), and co-starred in The Story Lady (1991 telefilm, with daughter Tandy Cronyn), Used People (1992, as Shirley MacLaine's mother), television film To Dance with the White Dog (1993, with Cronyn), Nobody's Fool (1994), and Camilla (also 1994, with Cronyn). Camilla proved to be her last performance, at the age of 84. Tandy was chosen by People magazine as one of the 50 Most Beautiful People in the world in 1990. 1986 – Kennedy Center Honors Recipient. Tandy's first marriage in 1932 to English actor Jack Hawkins produced one daughter, Susan Hawkins (1934–2004), who became an actress and the daughter-in-law of John Moynihan Tettemer, a former Passionist monk who authored I Was a Monk: The Autobiography of John Tettemer, and was cast in small roles in "Lost Horizon" (1937) and "Meet John Doe" (1941). After Tandy and Hawkins divorced in 1940, Tandy then married her second husband, Canadian actor Hume Cronyn, in 1942; the marriage lasted until her death in 1994. They had two children, daughter Tandy Cronyn (an actress who would co-star with her mother in the aforementioned NBC telefilm The Story Lady), and son Christopher Cronyn. Prior to moving to Connecticut, she lived with Hume Cronyn for many years in nearby Pound Ridge, New York, and they remained together until her death in 1994. In 1990, she was diagnosed with ovarian cancer and fought it for the next four years. Tandy also suffered from angina and glaucoma. Despite all this and her advancing age, she continued working. She died at home on 11 September 1994, in Easton, Connecticut, at age 85. 1957 The Glass Eye Julia Lester Short film presented in "Alfred Hitchcock Presents"
1956 Alfred Hitchcock Presents Edwina Freel Episode: "Toby"
1957 Alfred Hitchcock Presents Julia Lester Episode: "The Glass Eye"
1958 Alfred Hitchcock Presents Laura Bowlby Episode: "The Canary Sedan"
1994 ER Mrs Backer Episode: "Going Home"
^ a b c Berger, Marilyn (12 September 1994). "Jessica Tandy, a Patrician Star Of Theater and Film, Dies at 85". The New York Times. Retrieved 12 June 2012. ^ ""A History of the Guthrie Theater"" (PDF). ^ The Academy Awards: A Look At Jessica Tandy, oup.com, February 2007. ^ Cronyn, Hume (1991). Terrible Liar. New York: William Morrow and Company. p. 159. ISBN 0688128440. ^ Cronyn, Hume (1991). Terrible Liar. New York: William Morrow and Company. pp. 253–54. ISBN 0688128440. ^ "Miss Daisy, Jessica Tandy Win Top Oscars". Chicago Tribune. 27 March 1990. Retrieved 7 November 2010. ^ "Beautiful Through the Years". PEOPLE.com. Retrieved 1 February 2019. ^ Notes for Jessica Tandy, tcm.com; accessed July 11, 2016. ^ "Past Recipients: Crystal Award". Women In Film. Archived from the original on 20 August 2011. Retrieved 10 May 2011. ^ "Jessica Tandy." Internet Movie Database (IMDb.com): Accessed May 5, 2018. ^ "Susan Hawkins." Internet Movie Database: Accessed May 5, 2018. ^ "John Tettemer," in "AFI Catalog." Los Angeles, California: American Film Institute, accessed May 5, 2018. ^ "Berlinale: 1990 Prize Winners". berlinale.de (in German). Retrieved 17 March 2011. Wikimedia Commons has media related to Jessica Tandy.